Platinum Shuttles offer a reliable, safe, affordable and friendly door-to-door shuttle bus service for the residents of The Macarthur, Wollondilly, Sutherland Shire, South and South Western Suburbs of Sydney. Platinum Shuttles started business in earnest on the 1st September 2015. We acquired a part of/area from another shuttle bus company’s operations that were operating both in the areas above and in southern Sydney. They are based in the Sutherland area and still operate in that area. On 11th July 2016 Platinum Shuttles has since acquired this business and now operates out of both the Macarthur and Sutherland areas. 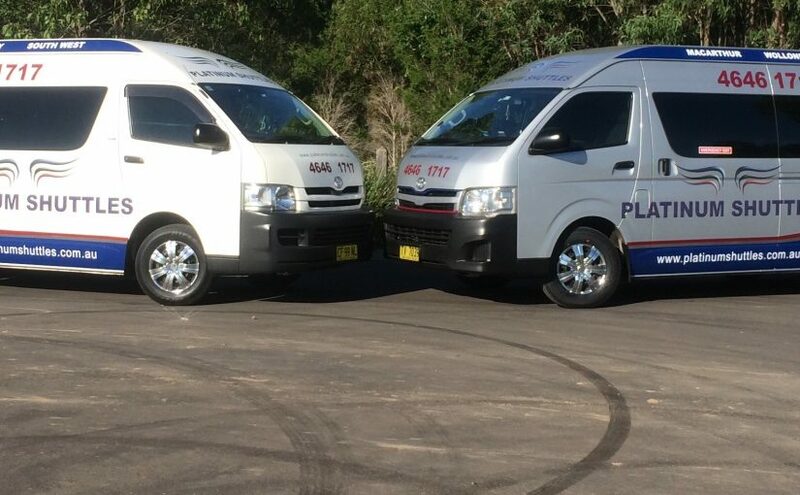 Platinum Shuttles is a family owned and operated business based in The Macarthur Area and Sutherland Shire. Whilst our shuttle bus company has just begun operations, our drivers possess the appropriate knowledge, skill and experience to operate a professional service. Steve (owner) has been driving a shuttle bus full time for the last one and a half years and on a casual basis for over 8 years. While our driver Glenn, who is also a local Macarthur resident, has over 10 years of shuttle bus driving experience. Whilst our drivers Glenn, has over 10 years of shuttle bus driving experience and George has over 8 years of experience. We also have a roster of casual drivers who are experienced in the industry. Platinum Shuttles is an Accredited Bus Service Operator issued by NSW Transport Roads and Maritime Service. Platinum Shuttles is owned by Steve and Mychele who both have a wealth of experience in dealing with the public. Steve has previously worked as a duty manager at a busy local hotel, worked in sales and marketing in the financial sector and worked in operational fields in the transport and distribution industry. Mychele is employed in the public service and keeps the behind the scenes of Platinum Shuttles in fine working order on her days off. Your holiday starts and finishes at your front door when you travel with Platinum Shuttles. We now have five 14 seat Toyota buses (13 passengers) in operation with luggage trailers. We also have access to buses seating up to 24 passengers or more upon request. We have baby seats and booster seats available upon request for the safety of your children. All vehicles are safety belt equipped. Having lived in the Macarthur Area for over 45 years, Steve understands the logistics that is required to get to and from destinations by the residents of Sydney’s greater south west. Having also driven shuttle buses in the Sutherland Shire, Steve has a strong understanding of the logistics in the southern suburbs. Whether you need to get to the airport, cruise ship terminals, have planned a day at the races, planned a work function or a hens/bucks night, or need to transport guests at your wedding, we are here to service your passenger transport needs.